I regularly say I want to entertain and invite people over more and the biggest reason I don’t is because I’ll forget that it doesn’t have to be a time consuming and laborious ordeal to prep for it. 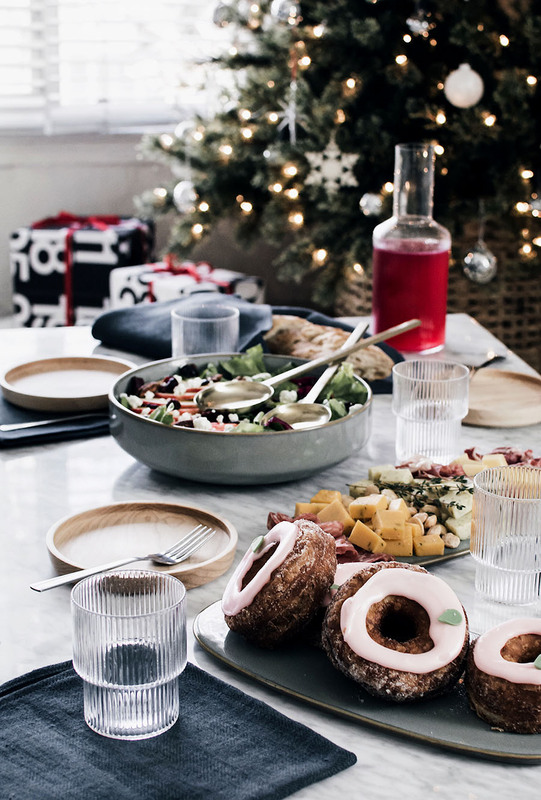 The holidays especially are a time that benefits from simplicity and being that it’s already a magical season, we really don’t need to do much to throw a great party! 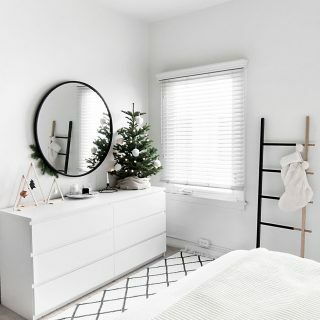 I invited a few girlfriends over for an intimate winter cocktail party and proved to myself once again that keeping it simple works. 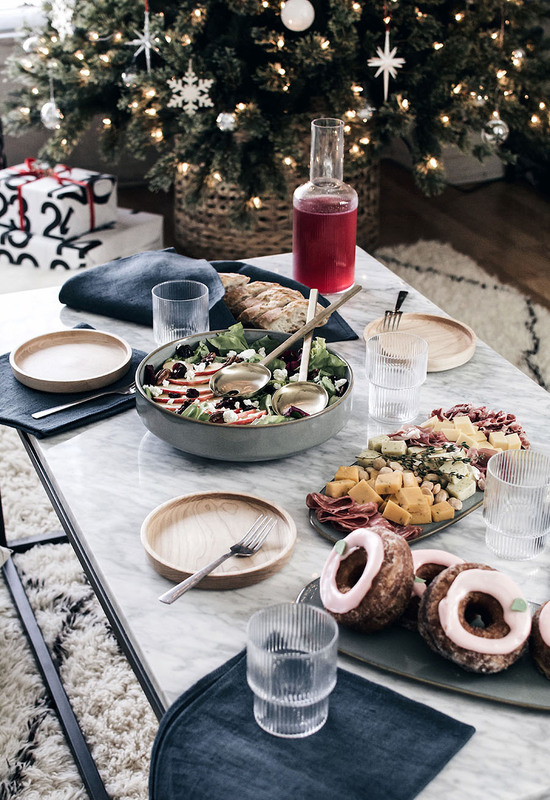 In partnership with Four Blocks South, a modern home goods store that provided all the gorgeous items for this table, here are a few simple tips to make your holiday entertaining easier and still awesome. 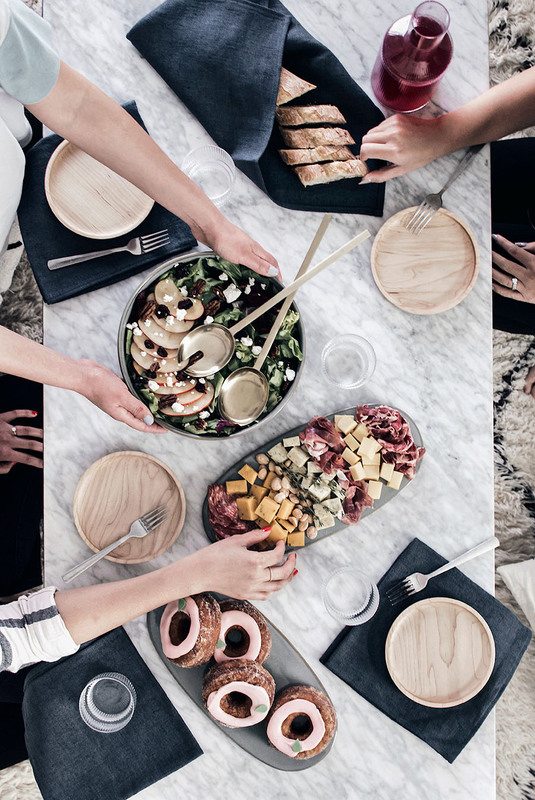 Switch things up and have your party on the coffee table. It makes a more intimate and cozy environment and it automatically makes everything more fun. Simply scatter some floor pillows and gather around the table. 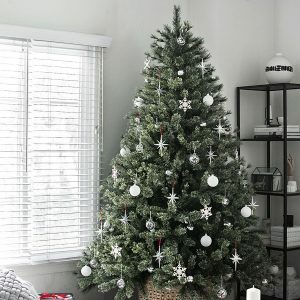 Bonus if your tree is set up nearby and you can all sit near its magic. 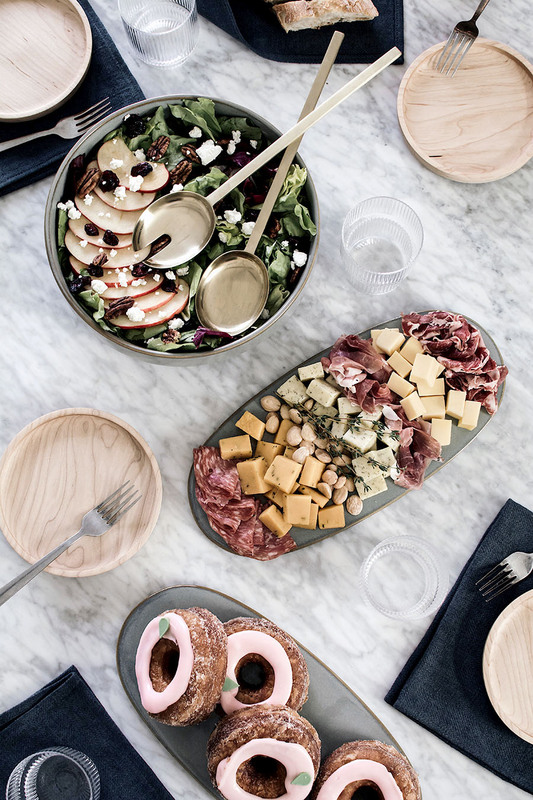 The charcuterie board is the forever winner of this category. It’s crowd-pleasing, plentiful, and beautiful to look at. You don’t even need to style it all that much for it to look great. Tip: Pre-cut the cheeses into bite size pieces so that there’s less fuss for your guests. In general, whatever can be pre-cut or pre-portioned, do that. Throw it all in a food processor or blender and blend until smooth. Use code OhMy15 for 15% off your order till 12-31-17! 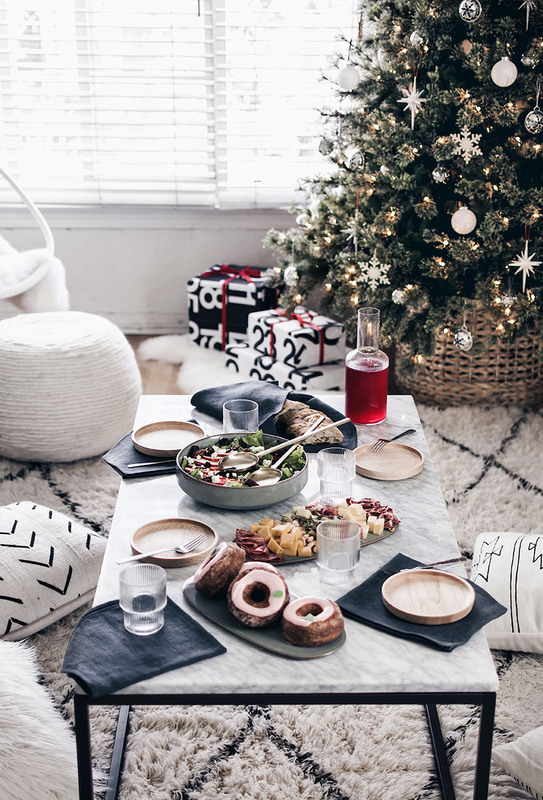 Hope this inspires your next at-home gathering, and be sure to check out all the offerings from Four Blocks South with the discount code they’re offering: 15% off your first order with code “OhMy15” valid through 12-31-17. A particularly cool detail is that they’re located in Toronto (Canadian friends, I’ve heard your woes, this is for you). Four Blocks South ships goods across North America and welcomes international orders as well. 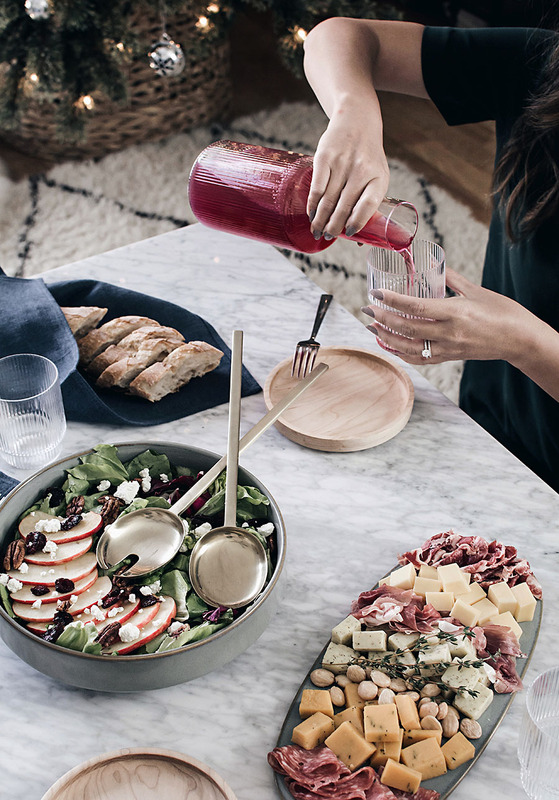 See if they might have the pieces you need for your holiday entertaining this season right here. This post is sponsored by Four Blocks South. 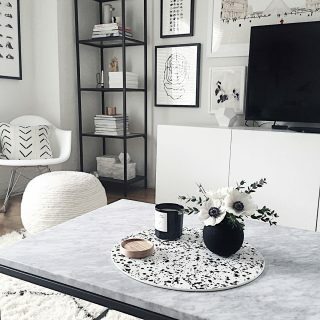 Love the idea of sitting on the floor, it makes everything more cozy in my opinion! Love those plates! Thanks for the recipes, looks easy enough for me to do. The simplicity of this party decor is doable for so many party-hosting challenged. And no coziness was harmed in this endeavor! Inspiring and useful post. Thanks! That cocktail sounds delicious! I might have to try that!